The Psychology faculty at ULM offer an undergraduate curriculum that provides a basic arts and sciences education including courses in all major content areas of Psychology. Psychology is consistently one of the most popular fields of study in the United States. Psychology is the scientific study of behavior, both animal and human, with the goal of understanding and improving humanity. Psychology is a very broad and diverse discipline that ranges from studies of brain structure and function to studies of behavior and cognition. Psychologists apply the scientific method and research techniques to increase our understanding of all aspects of behavior, both normal and abnormal. Psychology provides a knowledge base for understanding human behavior that has applications in professional fields such as counseling, law, education, business, medicine, public Relations and more. Our dedicated and caring faculty is known for working closely with students to help them build the knowledge and skills needed to succeed. The Bachelor of Arts degree at ULM is designed to help students become career and/or graduate school ready. The curriculum is modeled after the American Psychological Association’s (APA) Guidelines for the Undergraduate Psychology Major. This model is includes five goals: building a knowledge base of psychology, increasing critical thinking skills and skeptical inquiry through understanding of research methods, promoting ethical awareness and social responsibility, fostering communication skills, and to build skills which will advance students’ professional development. While the required and suggested courses provide knowledge and skills in psychology, elective courses can help students pursue minors in other areas to customize their learning experience. By designing the curriculum in accordance with the APA Guidelines for the Undergraduate Psychology Major, the department provides students with opportunities to gain highly valuable, career-relevant skills. The active Psychology Major will gain cognitive and academic skills in areas such as professional communication, quantitative analysis, critical thinking, organization, and time management. Students will also have opportunity to gain interpersonal skills such as social skills in group settings, listening skills, leadership skills, conscientiousness, respect for differences, and integrity. These skills are critical for careers or graduate training in Psychology, but are also very attractive to employers should students choose to pursue other disciplines. ULM Psychology also offers a Master of Science degree, with concentrations in General Psychology, Psychometrics, and Forensic Psychology. The General Psychology track helps prepare students to apply to doctoral level programs by offering opportunity for research practice and teaching assistant experience. The Psychometric programs gives students a firm foundation in the principles of psychological assessment. Many graduates of the Psychometric concentration become employed by mental health agencies conducting psychological testing. The Forensic Concentration is composed of classes from both Psychology and Criminal Justice. This rapidly growing field covers such areas criminology and theories of crime and delinquency. Psi Chi is the International Honor Society in Psychology, founded in 1929 for the purposes of encouraging, stimulating, and maintaining excellence in scholarship, and advancing the science of psychology. Membership is open to both graduate and undergraduate students who are making the study of psychology one of their major interests and who meet the minimum qualifications. Psi Chi is a member of the Association of College Honor Societies and is an affiliate of the American Psychological Association (APA) and the Association for Psychological Sciences (APS). 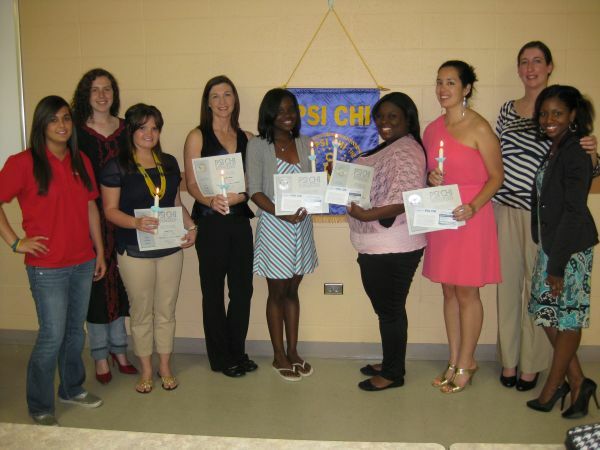 Psi Chi’s sister honor society is Psi Beta, the National Honor Society in Psychology for community and junior colleges. Contact Dr. Rick Stevens for more information. For our Facebook page search for "Psi Chi: University of Louisiana at Monroe Chapter". For general information about Psi Chi go to psichi.org. NEW: Contemporary Southern Psychology, a peer reviewed electronic journal administratively housed at the University of Louisiana Monroe library. Check out this great new resource!